It has been well over a decade now since I began my search for the 'perfect' field dog. Well, at least the perfect dog for me. Then, as now, I hunted a good amount of waterfowl along with pheasant, grouse, and the occasional rabbit. Heck, I would even throw in a squirrel hunt or two if I had the opportunity and the birds were not flying. My previous experiences with field dogs of many types told me that what I really needed were two dogs. One for ducks and one for all the other game I hunted. Practically speaking, however, the likelihood of that happening was about as far fetched as Osama giving himself up to President Bush. So, my search focused on finding that one dog that would do it all yet was not too much dog to have around the house. Since size was an issue, a nice well-bred Lab was out of the question and my focus turned to some of the other common hunting breeds. I was having trouble focusing on any one breed, as they all seemed to have a little something that I wanted but not quite enough of the other things that mattered. 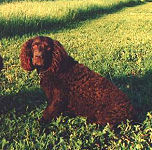 Then one day my wife came home from a business meeting and asked me if I had ever heard of the American Water Spaniel (AWS). I am sure that I looked at her with that skeptical, yet all too typical, husbandly glance and said "No, never heard of it." She said a colleague had told her about it and that he thought I ought to check it out. Still skeptical, I decided to see what I could find on the breed partly because the rest of my search was not going well and partly because I wanted to prove that I knew as much or more than her colleague; yet another husbandly trait. I found it hard to come up with much information about the AWS, which made my skepticism grow even more. There were only a handful of breeders to speak with about the breed and, of course, none of them had anything bad to say. One of the breeders, however, was full of information and willing to send out material that he had collected over the years concerning the AWS. To my delight these magazine articles and excerpts from various books gave me the good, bad, and ugly about the AWS. "...a dog with a nose for game, tenacity for retrieving, and a coat for cold-water retriever work." My search for information taught me that this breed is one of America's own that had probably been around since sometime in the middle 1800's. It had been a popular breed among many market hunters and backwoodsmen of the marsh country commonly found in the upper Great Lakes region, Northeastern US, and Mid-Atlantic States. A principal characteristic that many believed was the cause of its popularity was, and is, it's willingness to hunt anything and everything; a trait prized by people who, like me, were unable to stock a kennel full of canine specialists. But, while this trait was highly prized, it also lead to the breed's decline in popularity as the attractiveness of field trials and the specialists that performed in them began to have an influence on the breeds sought by hunters. So, following World War II the AWS began to take a back seat to the Lab and Springer Spaniel.